Love mac and cheese? 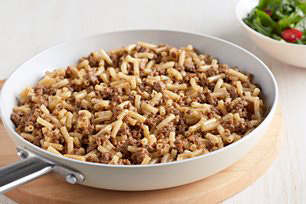 With the addition of ground beef and seasonings, a mac and cheese dinner becomes this Easy Cheesy Hamburger Mac—all in just 20 minutes. Cook Macaroni in saucepan as directed on package. Meanwhile, brown meat in large skillet on medium heat. Add Cheese Sauce Mix and all remaining ingredients except macaroni; mix well. Simmer on low heat 5 min. or until heated through, stirring occasionally. Drain macaroni. Add to meat mixture; mix lightly. Serve this mac and cheese with a mixed green salad tossed with your favourite Kraft Dressing for a quick and tasty weekday meal. Substitute 1 lb. (450 g) boneless skinless chicken breasts, cut into chunks, for the extra-lean ground beef. Cook Macaroni as directed. Meanwhile, cook and stir chicken in 1 Tbsp. oil in large skillet until done. Add Cheese Sauce Mix and all remaining ingredients except macaroni; mix well. Continue as directed.